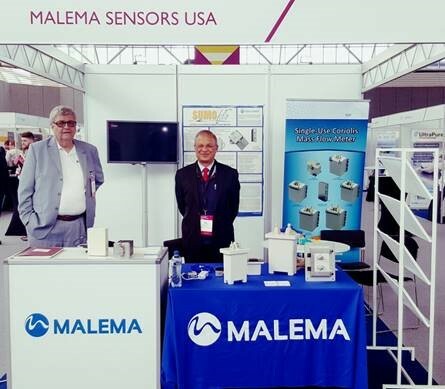 Malema exhibited at BioProcess International European Summit held on 24-25 April 2017 at RAI Amsterdam. The summit featured state-of-the-art solutions a manufacturer needs in developing and producing quality drugs. Featured in this event is the SumoFlo® all-PEEK wetted Coriolis mass flow meter - designed for measuring liquids in single-use bioprocessing applications. The SumoFlo® CPFM-8100 series Coriolis Single-Use Mass Flow Meter is specifically designed for measuring liquids in bio-pharmaceutical and other applications that require all gamma-sterilizable wetted surfaces. In addition to SumoFlo® flow meters, Malema also launched its latest product: BCV-910 pinch control valves. BCV-910 is a line of compact, cost-effective, high-performance pinch control valves designed for use with Single-Use flexible tubing systems in the Biotechnology and Pharmaceutical industries. We would like to thank all our visitors for taking their time to visit our booth. Please do not hesitate to contact us at malema@malema.com with any questions or further information.